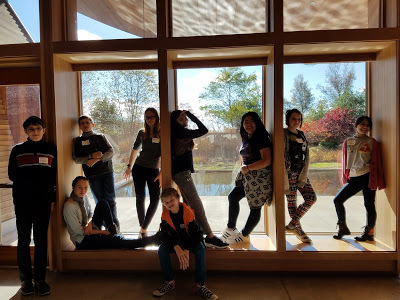 Our thanks to Laura Mike for providing this update and photos featuring the HMS Civil Rights team! Laura and Charlotte Agell are the team advisors. 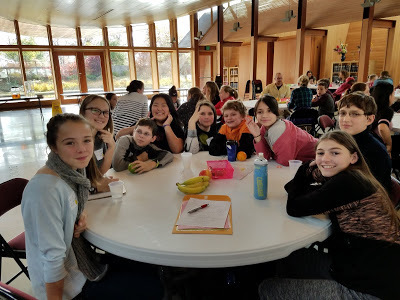 The HMS Civil Rights Team (CRT) attended the annual student training on November 7th. The training was held at the Congregation Bet Ha'am in South Portland. Brandon Baldwin, Project Manager for Maine's Civil Rights Team Project of the Attorney General's Office, facilitated the training. The mission of Civil Rights Teams is to get schools to think and talk about the categories protected under the Maine Civil Rights Law. There are close 200 Civil Rights Teams in schools across the state. 1.) that bullying becomes a civil rights issue when it is related to race, skin color, national origin, ancestry, religion, disabilities (physical and mental), gender (including gender identity and expression) and sexual orientation. 2.) the importance of asking people what pronouns they go by or using gender neutral terms. 3.) to be aware of and inclusive of families that may look different. 1.) Community Circles that were facilitated by Civl Rights Team Advisors and provided students the opportunity to talk openly about these issues. 2.) Alike and Different exercises to illustrate what we have in common with others and how we differ from one another. 3.) brainstorming and talking what all religions have in common. The HMS CRT left the training energized and filled with ideas for activities to get our school thinking and talking about these issues!